Welcome to Twofer Card Challenge #2. Thanks to all that played along with our first challenge last month. The gallery was filled is beautiful feather cards! I used the same die for the two cards above. This is the Stacking Hearts Die from Simon Says Stamp. Both cards have the same background technique. This is were I take one of my "mop up" paper towels, place it over top of a piece of watercolour paper or mixed media paper, spritz with water and then press firmly with my fingers to transfer the ink. The colours are always soft and delicate. I keep these backgrounds in my stash for when I want a softer looking card (or cards!). Today is the day. I die-cut the stacking hearts from white card stock, removed all the center hearts (which are already part of the die-cut) and I'm left with a frame of hearts. I added a simple sentiment with white embossing on black card for the "sending" and black die-cut hugs (cut from black card stock and black foam as well and layered with the foam underneath for added dimension). I used my clear wink of stella to add a bit of shimmer to the hugs. For the finishing touch, I added some translucent blue and clear sequins for more sparkle. The card above uses the hearts outline of the die, the card below uses the centers. I sponged white card stock with worn lipstick and cut out the hearts. I didn't worry about the sponging being perfect. I like that the hearts have colour variation on each one. The background matches with the paper towel transfer of ink in worn lipstick and mustard seed. I stamped the sentiment in Delicata Gold ink. There you have it ... two different card designs for two different occasions using the same die. It's lots of fun. 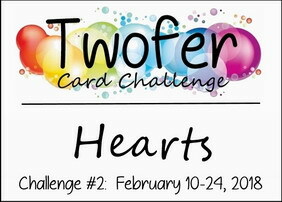 Check out the challenge blog to see the amazing "Hearts" cards from the rest of our talented Design Team. And then come play along. The challenge is open for two weeks, closing on Feb. 24th. Hope to see you in the gallery! I'm sending the first card (Sending Hugs) to the Simon Says Wednesday Challenge - It Must be Love and AAA Cards #108 - All You Need is Love. These look great. Love how you used the reverse image of the die! Those backgrounds are so pretty, Loll. Great idea to use the mop up paper towels. I want to try to remember that. I usually just toss 'em not even thinking how pretty they might look as a background. They both look wonderful. I also really like how you used the outline on one card and the centers on the other. Way to stretch your supplies, too! Awesome! :) Hugs! Both cards are soft and pretty! Two beautiful cards!! I like that you used the inside of the hearts as well as the outside. Your background are so pretty!! Saw these beauties just on Darnell's 2fer blog a few moments ago, and loved 'em. Love 'em all over again at the closeup. Love that you were able to use the inlay from the hearts die to form the design on #2 (clever you!) and the design looks delicate & pretty on each card. Love the idea of the mop up spritz to color another c/s, as it makes such a soft look with so much texture. TFS & happy weekend. Hugs too. Your paper towels left quite an impression on both of your cards and on me! I'm going to give your technique a try. Beautiful twofer, Loll! The white heart outline really shows off the background behind it and the bold black sentiment is a wonderful contrast. Your pink and gold combination is absolutely gorgeous! I love your mop-up paper towel backgrounds on both your cards, Loll. Especially the 2nd card where the texture from the paper towel really shows up. Both beautiful CAS designs. So weird...I just put the stacked hearts die on my SSS wishlist...today! TFS my friend. Such a fun Twofer Challenge. Hugs. Using the paper towel to do double duty is so clever. It gives great texture and fun to the background. Love that you used both parts of the die. Great cards, Loll. Loving that aqua background and the use of the die cut hearts. The pink one is pretty too. 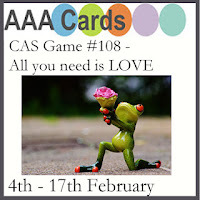 Thanks for joining in with the current AAA Cards challenge. How gorgeous! Love your inking!Thanks so much for playing Simon Says Stamp Wednesday “It Must Be Love” Challenge! Beautiful colors and design. Well done! I am so impressed with your 'mop-up' technique, Loll! I just tossed a few paper towels from a watercolor project, and retrieved them when I read your post :) This heart die is going on my wishlist even though Valentine's Day will be gone by the time I get it...I love how you used it on both cards, and how you achieved a variation in those pretty pinks on your thank you card! Thanks so much for inspiring us to play along...count me in!!! Those backgrounds are so soft and pretty. I always forget to save those mopped up paper towels. Fabulous inspirations. 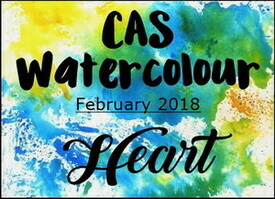 Both are beautifully done and I love the water colored backgrounds on both. Both of these are so pretty, Loll! I love the soft colors and the imprint of the paper towels! The backgrounds are so perfect for these little hearts! I love the idea of using your mop-up paper towel. There are times when I want a soft look to background paper. I especially like it on watercolor paper because the texture of the paper is very visable. Thanks for all that you share Loll. I hope you are feeling well. Love the soft background colors on these cards while also making use of those mop up towels that normally fill my trash can so fast(!) Have seen your idea for this on some of your other posts, but hit me this time to actually start saving and using those paper towels. Thanks for the creative idea and the inspiration from your beautiful cards. what super twofer cards and their designs are so brilliantly created. Love the subtle colours you have created for the backgrounds. What a great mop up idea Loll. Thanks for the tip. Love the soft backgrounds and beautiful hearts. Lovely Twofer cards. Such pretty cards Loll, love the effect with the paper towel. Fab die too, can see lots of uses for this one...how easy to use those little hearts from inside. Clever you! Pretty cards with lovely backgrounds. Great texture from the paper towel. Who would've thought? It's a "must try" technique! both your cards are gorgeous! thanks for joining us at AAA Cards! Loll, you always have the most beautiful cards! I aspire to create cards like yours! You're probably a lot more adventuresome that I am...which is how you create so many beautiful backgrounds! Love these two cards! Gorgeous cards! Love them both! Thanks for playing along with us at AAA Cards! WOW! Super makes Loll. For some reason this challenge cause me no end of issues and I've ended up making six cards before I got it right!!! Two awesome cards! SO beautiful! I love them both.